A little bit of fun in the office this time last week as we were wearing our football shirts! 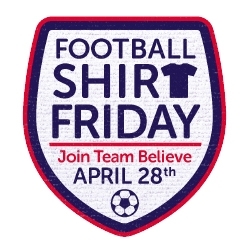 The office members took part in Football Shirt Friday. The fundraising initiative, which asks people to wear their football shirt and donate £2 to the Bobby Moore Fund, draws inspiration from one of the most famous images of Bobby taken at the 1970 World Cup, where he swapped football shirts with Brazil legend Pelé. Seen as a sign of respect between the opposing players, it is a gesture that has been recreated by footballers worldwide ever since. Bobby’s widow, Stephanie Moore MBE, set up the fund in partnership with Cancer Research UK to raise money for research into the disease. To date, over £23m has been raised to fund ground breaking bowel cancer research. To donate £2 to the Bobby Moore Fund, text GOAL002 to 70070. Texts cost £2 plus 1 standard rate text. 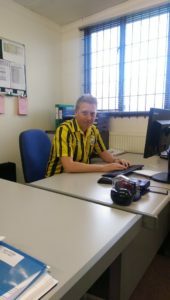 Here is our operatio ns director Luke wearing his Sheffield Wednesday shirt from 1992/93 season. There were other shirts on show last week but no photo evidence unfortunately. The retro shirts were in full force, we had the Leeds 1991/92, and yes it has been a tough week for the Leeds fan.